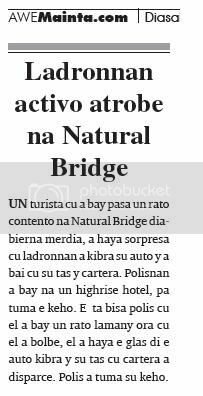 one tourist cu owing to bay happen one rato contento at natural bridge diabierna afternoon, owing to achieve surprise cu ladronnan owing to break his car y owing to go cu his bag y cartera. polisnan owing to bay at one highrise hotel, for take the complaint. the is tell police cu past owing to bay one rato lamany hour cu past owing to go back, past owing to achieve the glass of the car break y his bag cu cartera owing to disparce. police did take his complaint. polisnan of beach is go saturday madruga at one cas at tanki leendert for one ladronisia. at the cas police is talk cu the owner of the cas, that is tell police cu two man owing to break his door of cas y owing to steal some cos in his cas. the is tell cu one witness owing to bise cu the two hombernan owing to come in one daihatsu blanco owing to enter in the cas y owing to leave cu one box under they arm. they owing to go cu two celular y also owing to bay cu his box strong. according the witness, the two hombernan is uno color cla y the another is color dark, of 1.90 m high. they owing to bise if the open his mouth they're los two ball on dje, after they owing to enter the car y owing to bay for of the sitio. the inhabitant is tell in the box strong the had his joyanan. the caso is in investigacion. presencia of police owing to wordo ask saturday 10.30 of night, at height of wit gele kruis in pampunastraat for one atraco. at the sitio police is come across cu the two victimanan k.a.k. of 23 y d.f.b. 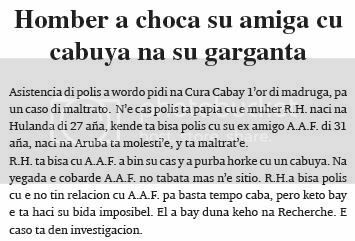 of 20 year, all two naci at aruba, that is declara cu they was march y cuatro boy young owing to acercanan y they owing to fly on they y owing to fight cu they. they owing to bisanan for they coopera, but they're throw they. 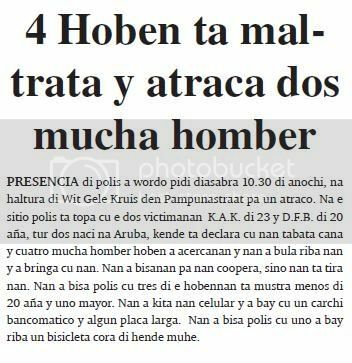 they owing to tell police cu three of the hobennan is show less of 20 year y uno parent. they owing to less they celular y owing to bay cu one carchi bancomatico y some coin larga. they owing to tell police cu uno owing to bay on one bisicleta cora of person muhe. 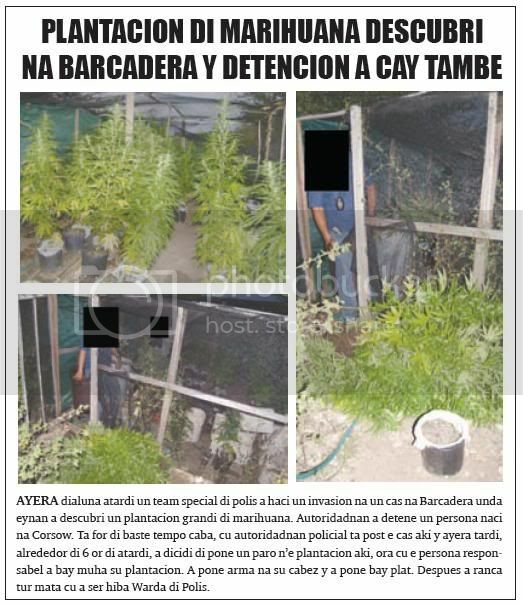 yesterday monday nightfall one team special of police owing to haci one invasion at one cas at barcadera where eynan owing to descubri one plantacion big of marihuana. autoridadnan owing to detene one person naci at corsow. is for of baste time end, cu autoridadnan policial is post the cas here y yesterday tardi, alrededor of 6 or of nightfall, owing to dicidi of place one paro n’e plantacion here, hour cu the person responsible owing to bay wet his plantacion. owing to place arm at his cabez y owing to place bay plat. after owing to ranca all kill cu owing to being take away keep of police. ruben damian marin owing to present diabierna ultimo in corte, but his caso owing to stay posponi same cu all the another sospechosonan in the caso of ladronicia of 1.6 miyon dollar of banconan owing to present fast huez. 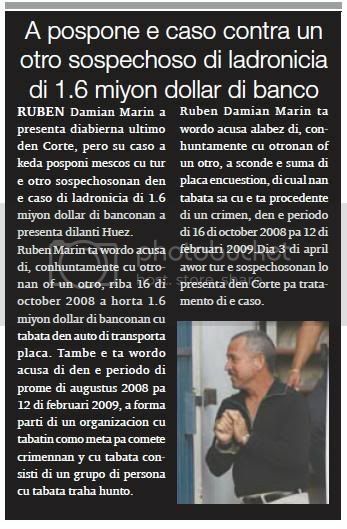 ruben marin is wordo acusa of, conhuntamente cu others or one another, on 16 of october 2008 owing to steal 1.6 miyon dollar of banconan cu was in car of transporta coin. also the is wordo acusa of in the period of first of august 2008 for 12 of feburary 2009, owing to form part of one organizacion cu had because; aim for comete crimennan y cu was consisti of one are of person cu was work together. 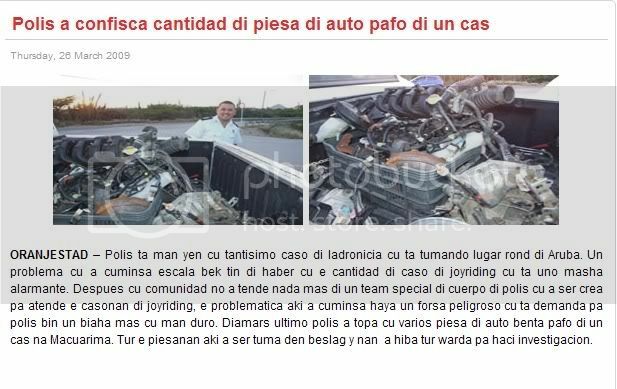 ruben damian marin is wordo acusa alabez of, conhuntamente cu others or one another, owing to sconde the suma of coin encuestion, of cual they was know cu the is procedente of one crimen, in the period of 16 of october 2008 for 12 of feburary 2009.dia 3 of april now all the sospechosonan will present in corte for tratamento of the caso. monday madruga during patrol police attentive owing to come achieve they self cu one volkswagen polo let behind cu all tire flat, without number y without stuurwiel, then let behind mei-mei of caminda at tanki leendert. police owing to ask for one takelwagen come buske y hibe at keep of police at balashi, where the car owing to stay at disposicion of the owner. 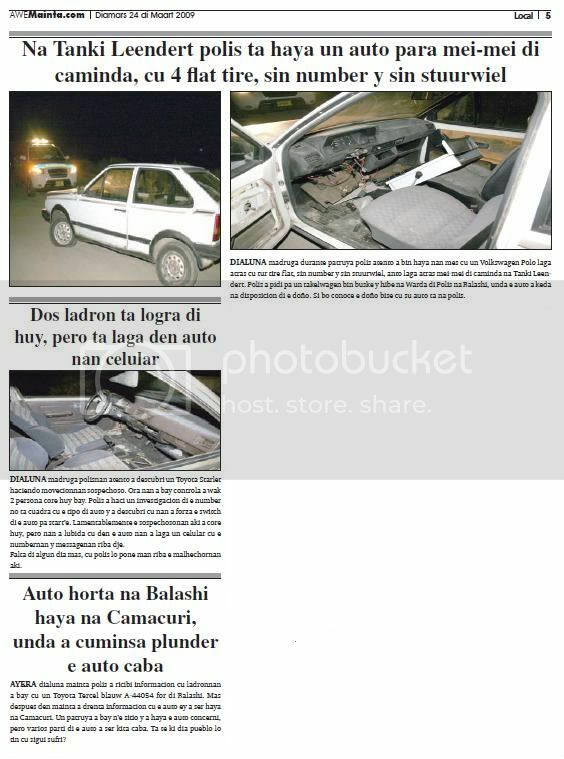 if do you conoce the owner bise cu his car is at police. monday madruga polisnan attentive owing to descubri one toyota starlet haciendo movecionnan sospechoso. hour they owing to bay controla owing to look at 2 person core huy bay. 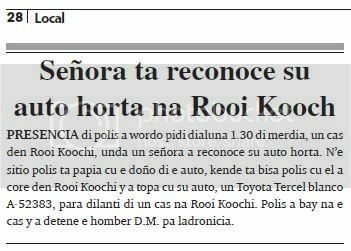 police owing to haci one investigacion of the number do not cuadra cu the type of car y owing to descubri cu they owing to forza the switch of the car for start’e. alas the sospechosonan here owing to core huy, but they owing to forget cu in the car they owing to let one celular cu the numbernan y messagenan on dje. miss of some day more, cu police will place hand on the malhechornan here. yesterday monday morning police owing to ricibi informacion cu ladronnan owing to bay cu one toyota tercel blauw a-44054 for of balashi. more after in morning owing to enter informacion cu the car ey owing to being achieve at camacuri. one patrol owing to bay n’e sitio y owing to achieve the car concerni, but several part of the car owing to being less end. is till what day people will have cu follow abide? the sospechosonan juan calderon thomas y dennis oduber owing to present yesterday morning fast huez comisario caminda once more they detencion owing to stay prolonga cu 8 day. both person is deteni relaciona cu one caso of extorsion y menaza of dead on family v.d.kuyp caminda is being talk of thousand of dollar cu will is in game. t’asina cu dennis oduber is stop on cu the not have nothing of haci cu the caso here, while cu the another sospehoso is tell cu dennis oduber is envolvi. 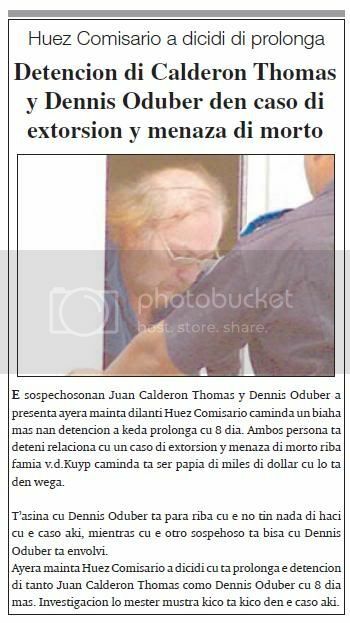 yesterday morning huez comisario owing to dicidi cu is prolonga the detencion of tanto juan calderon thomas because; dennis oduber cu 8 day more. investigacion will have to show kico is kico in the caso here. the caso contra of j.m.j.p., that is wordo acusa of conhuntamente cu another or others, ladronicia of one or more tire of one person, on day 15 of september, 2007.
for 9’or of morning, will have the caso contra of owing to.r.w., that is wordo acusa of, cu the intención of take vida of one person, owing to intencionalmente staca the person here several trip cu one cuchiu at his zij on day 29 of march, 2007.
for 10’or of morning, will have the caso contra of r.e.r.g., y j.a.s.t., kendenan is wordo acusa of exportación y/of transporte y/ or posesión of cocaína, on day 2 of december, 2008.
for 10’or y mey of morning will have the caso contra of l.m.t., that is wordo acusa of posesión of one paspoort false on day 23 of december, 2008 y/of of owing to intencionalmente haci usage of one paspoort cu not was on his name door of present this at one ambtenaar of imigracion y/of acolyte of personal of one aerolínea. for 10’or y 50, will bay have the caso of c.jc.e., that is wordo acusa of posesión of one paspoort false on day 8 of november, 2008 y/ or 15 of november 2008 y/of 7 of december, 2008 y/of 23 of december, 2008.
for 11’or y 20 of morning will bay have the caso of owing to.s.p.t., that is wordo acusa of owing to comete abusonan deshonesto at one or more ocasión in the period of first of march 2007 till cu day 25 of november 2007 cu one person cu the time ey was have 12 year but still not was have 16 year. also t. is wordo acusa of owing to intencionalmente maltrata the person here on day 25 of november, 2007, door of dal’e more trip cu his fist in his cara. door of this the person owing to resulta injury y/of owing to abide dolor. 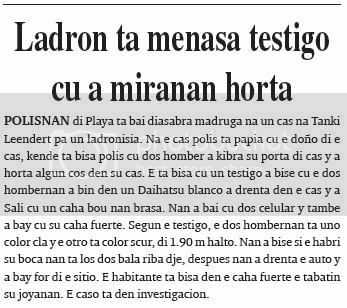 monday morning police owing to ricibi informacion cu ladronnan owing to bay cu one toyota tercel blauw a-44054 for of balashi. more after in morning owing to enter informacion cu the car ey owing to being achieve at camacuri. one patrol owing to bay n’e sitio y owing to achieve the car concerni, but several part of the car owing to being less end. is till what day people will have cu follow abide? one madam y his girlfriend owing to leave diadomingo night, 7.30 one rato y owing to go back bek 11 or. at instant cu they owing to go back cas, they owing to see cu they owing to achieve visit of thief. this is thing one madam owing to declara, hour cu past owing to bay keep of north diadomingo night. the is tell cu ladronnan owing to break the door fast y owing to compel all three door of bedroom y owing to bay cu some articulo, of much value. they're achieve miss of one laptop mark h.p., game of game cube, nintendo, dvd player mark daewoo, two holoshi of hand, one mark guess y the another quartz, 4 celular, two l.g., one nokia y one samsung. police owing to send t.o.d n’e sitio y recherche have the caso in investigacion. presencia of police owing to wordo ask monday 1.30 of afternoon, one cas in rooi koochi, where one madam owing to reconoce his car steal. 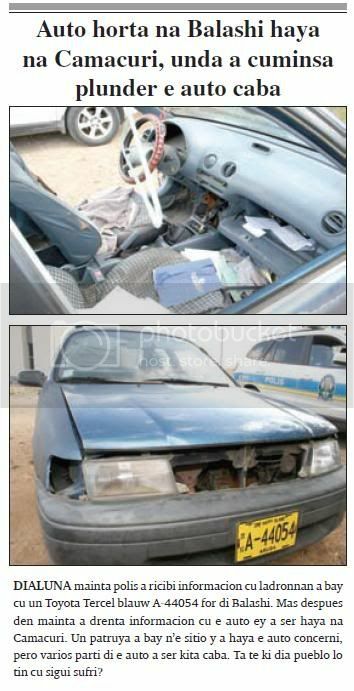 n’e sitio police is talk cu the owner of the car, that is tell police cu past owing to core in rooi koochi y owing to come across cu his car, one toyota tercel blanco a-52383, stop fast of one cas at rooi koochi. police owing to bay at the cas y owing to detene he d.m. for ladronicia. 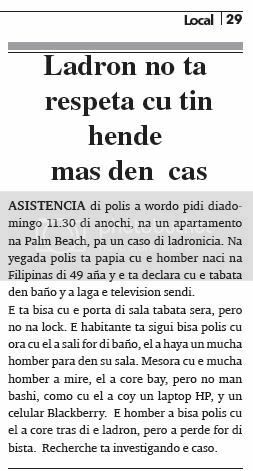 asistencia of police owing to wordo ask diadomingo 11.30 of night, at one apartment at palm beach, for one caso of ladronicia. at arrival police is talk cu he naci at filipinas of 49 year y the is declara cu the was in bathroom y owing to let the television sendi. the is tell cu the door of sitting-room was close, but not at lock. the inhabitant is follow tell police cu hour cu past owing to leave for of bathroom, past owing to achieve one boy stop in his sitting-room. at once cu the boy owing to mire, past owing to core bay, but not hand bashi, because; cu past owing to coy one laptop hp, y one celular blackberry. he owing to tell police cu past owing to core behind the thief, but owing to lose for of view. recherche is investigando the caso. 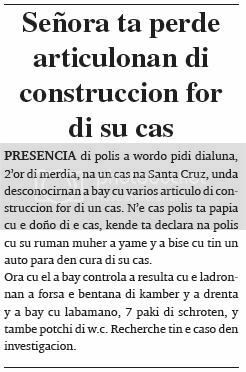 presencia of police owing to wordo ask monday, 2’or of afternoon, at one cas at santa cruz, where desconocirnan owing to bay cu several articulo of construccion for of one cas. n’e cas police is talk cu the owner of the cas, that is declara at police cu his brother muher owing to yame y owing to bise cu have one car stop in cura of his cas. hour cu past owing to bay controla owing to resulta cu the ladronnan owing to compel the window of bedroom y owing to enter y owing to bay cu labamano, 7 package of schroten, y also potchi of w.c. recherche have the caso in investigacion. asistencia of police owing to wordo ask at cura cabay 1’or of madruga, for one caso of maltrato. n’e cas police is talk cu the muher r.h. naci at the netherlands of 27 year, that is tell police cu his ex amigo owing to.a.f. 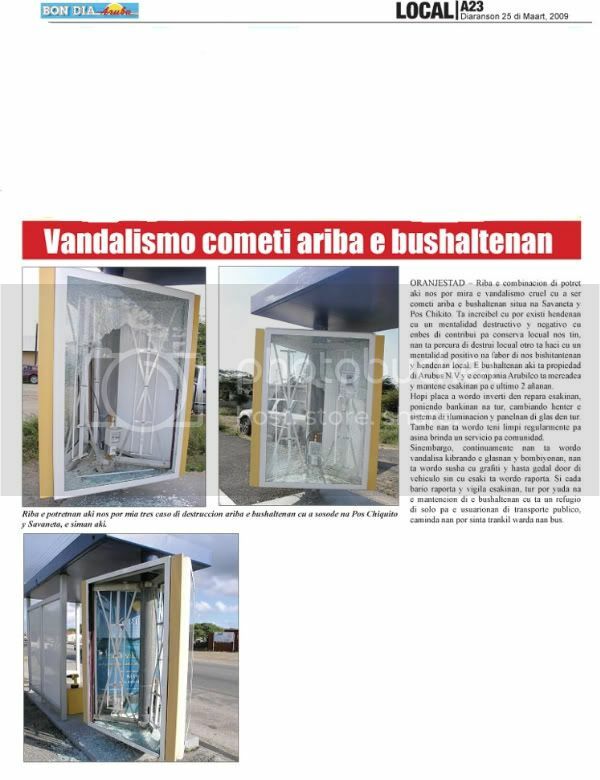 of 31 year, naci at aruba is molesti’e, y is maltrat’e. r.h. is tell cu owing to.a.f. owing to come his cas y owing to try horke cu one cabuya. at arrival the cobarde owing to.a.f. not was more n’e sitio. r.h.a tell police cu the not have relacion cu owing to.a.f. for enough time end, but keto bay the is haci his life impossible. past owing to bay give complaint at recherche. the caso is in investigacion. 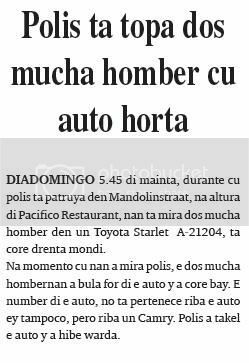 diadomingo 5.45 of morning, during cu police is patrol in mandolinstraat, at height of pacifico restaurant, they're see two boy in one toyota starlet a-21204, is core enter forest. at instant cu they owing to see police, the two child hombernan owing to fly for of the car y owing to core bay. the number of the car, do not pertenece on the car ey niether, but on one camry. police owing to takel the car y owing to hibe keep.